This was my first challenge with Alison Lumbatis of Get Your Pretty On. I learned about it from Tiffany’s blog on this post. I was a little unsure about it when I first started. You see, I’m a rather conservative person in general so therefore and I dress conservatively. I generally do things the traditional way and I’m a rule follower. So I was afraid at first that I wouldn’t like it. What if she chooses articles I don’t like? What if she combines pieces in a way I don’t like? What if this is a waste of money? 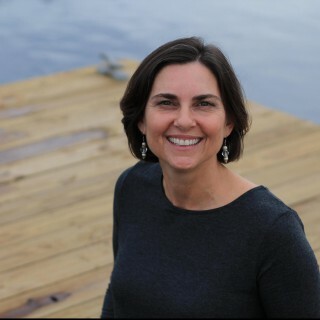 But the idea intrigued me and I was really ready for someone to push into trying some new things. Besides, there was no GYPO police…if I didn’t like something I could just NOT BUY IT! But when the list came out, I was pleased by what was on it. No huge surprises. Nothing too weird or funky. 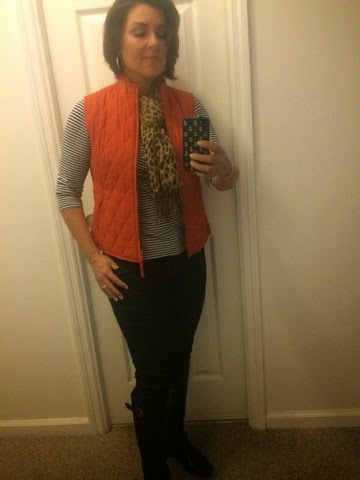 In fact, I already had a good many pieces and the new things I needed to get were not TOO far outside my comfort zone (well, except for maybe the leather leggings, which I never bought.) I was excited about learning how to style the new pieces with things I already had. Perhaps the biggest thing that gave me confidence is that since Alison is in my age range, she would not be putting outfits together that only look good on teens or twenties! I wanted to look good but I didn’t want to look ridiculous or like I was trying to look younger than I am! I was surprised when I started seeing outfits on the Facebook page before the challenge even began. People were combining on their own! (Is that even allowed? Remember, rule follower!) Then I realized it was people who had already been in other challenges and they were experimenting with the pieces based on their knowledge from those previous challenges. Their outfits were cute! I was encouraged and my excitement grew. I was itching to get started! Finally the day arrived for the challenge to start. I was so excited to see the first outfit in my email inbox! I loved it right away! It involved a striped shirt and I’ve always loved stripes! I was surprised to learn that for some people stripes were something new. Although the weather was not cool enough where I live to be able to wear the outfits the way they were put together, I made modifications. Also, I plan to wear them as Alison styled them when the weather cools off. Mixing patterns – I had never done that before. I didn’t really feel comfortable doing it but obediently wore what was recommended and was surprised at how cute it looks (when done right). Booties – This was WAAAAY outside of my comfort zone. I’ve not been a boot person in general but a few years ago I did finally get some riding boots. I haven’t worn them very often because I didn’t really know what to pair them with. So when I saw booties on the list I was very resistant. I found a pair at Old Navy for $30. Since it wasn’t a huge investment, I decided to give them a try. I’ve been pleasantly surprised that I don’t hate them! Long necklaces – The challenge called for a tassel necklace but I never did find one I really liked. The ones I found had a lot more bling on them (beads, etc) than I like. I’m a Plain Jane kinda girl. So I ended up buying a large pearl wrapped in silver wire on a long silver necklace (Old Navy) and used that in place of the tassel. I like having something besides a scarf to add interest, especially to a plain outfit. It really dresses it up! 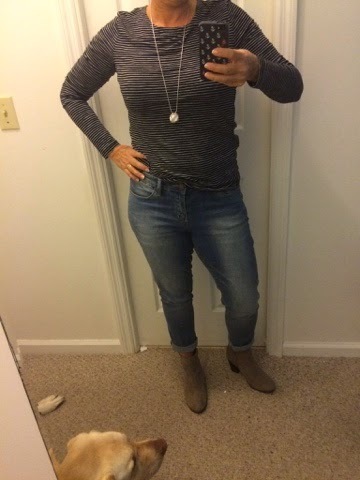 Skinny jeans – I confess that I had one pair of black skinny jeans from Forever 21 in my closet pre challenge, but they were a size too big so they were not tight. For the challenge I got a pair of dark wash skinnies and, much later when I got comfortable in them, a pair of grey skinnies. For $7.90 I was willing to try them, and I found out that I love them! They make boots fit great, look good with flats as well as booties, and can be worn rolled up or down. They are so versatile! 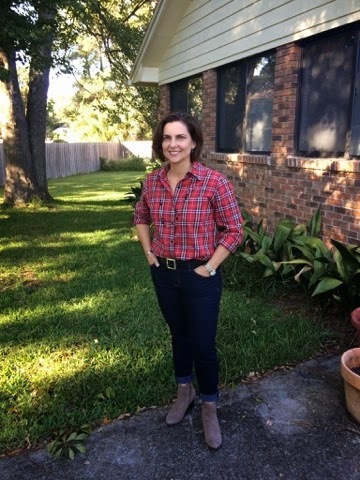 Boyfriend jeans – All my jeans other jeans were either bootcut or straight. 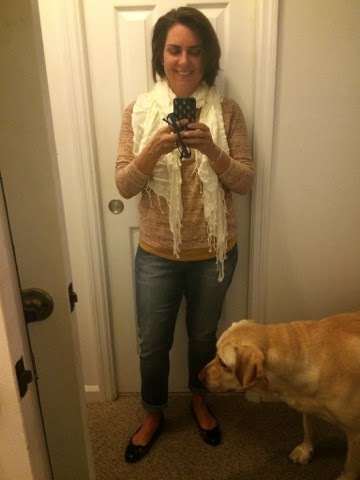 These jeans are so comfy and soft just a little loose but with a flattering taper! I found them on the clearance rack at Marshall’s. The brand is Max Jeans, which I’d never heard of before, but I really like them. I forget about Marshall’s. I’ll need to check them out more often. Leopard print – This used to be way out of my comfort zone. It felt so *wild*! (tee hee!) Then one year I bought a tankini that was leopard print and I loved it! I didn’t own anything else so wild besides a pair of earrings that my son had bought me. 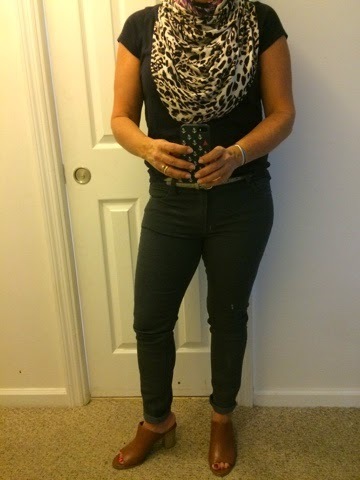 The challenge called for two leopard items: a scarf and flats. I’ve really enjoyed learning how to style these items in this print. I never knew it could be worn as a neutral and I would have never paired it with red if I hadn’t seen other gals’ pictures on the FB page. It’s like having a new spice to add to the cabinet! So as you can see, I have learned quite a few new things that will carry over into other seasons and other pieces in my wardrobe. This challenge has changed the way I look at pieces when I shop. It has changed my shopping quite a bit, actually! It has made shopping fun again! Feeling put together has spilled over into other areas as well. I’ve been wearing make up again and I take the time to fix my hair. And all of that gives me a boost of confidence and since I feel better it makes my husband happy too! And we all want to keep our husbands happy, don’t we gals? I really look forward to the Build Your Basics Wardrobe Challenge that begins very soon! Won’t you join me? Click here to sign up! Then tell me in the comments if you do! Sheila – you were definitely a “star pupil” of the challenge. I loved all of your interpretations and the chic, pulled together looks you created. So happy you decided to join! Totally and completely love this post!! Had so much fun “meeting” you and linking up during the challenge.